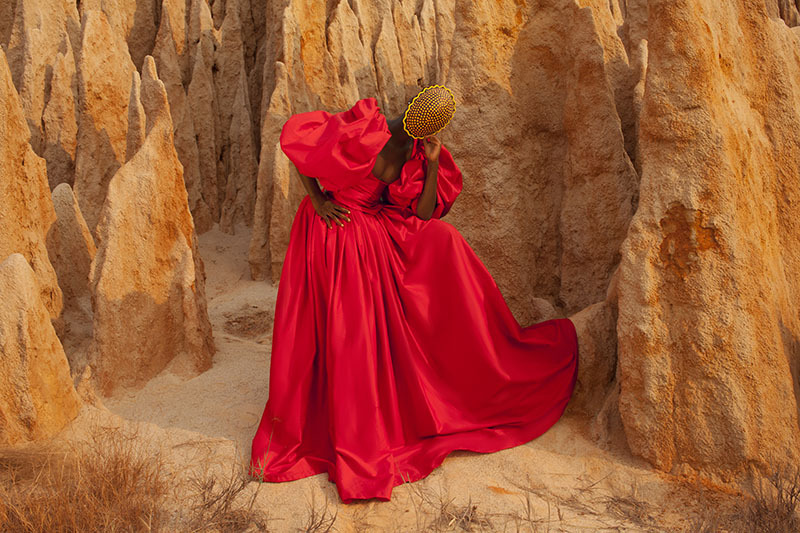 Keyezua sees herself as a storyteller that is currently reinventing herself to tell the day-to-day stories of women around the world that make her uncomfortable to remain silent. 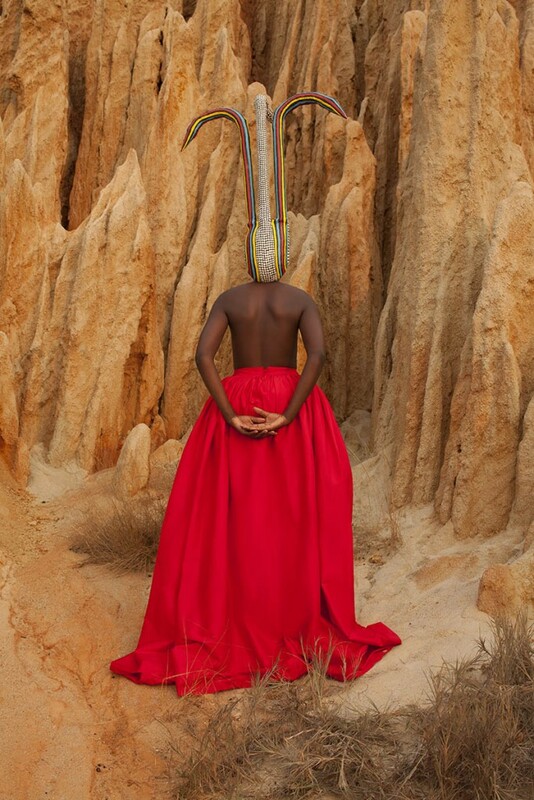 As a woman, identity formations within and beyond her own binational Angolan-Dutch identity are a cross cutting theme in all of her work. She eschews the role of being a casual observer in a world that is going through fundamental social, economic and political changes and wants to use her platform to make things right in her own way. 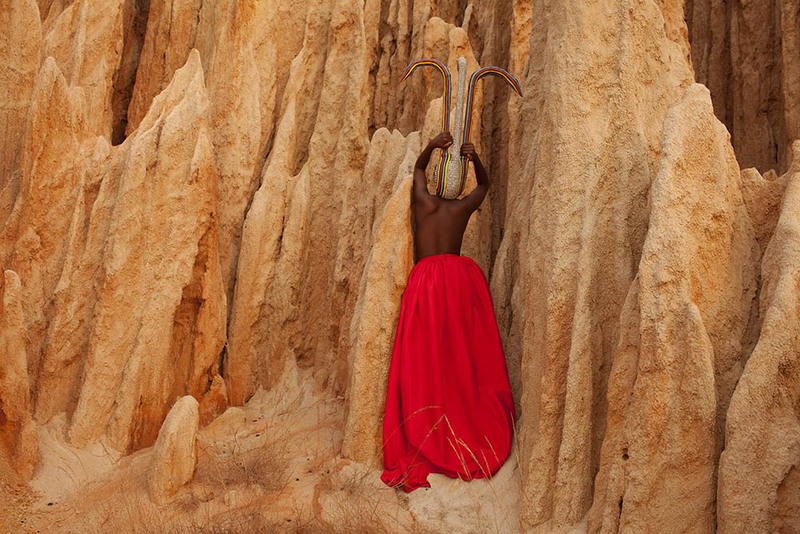 For Keyezua, art needs to demand respect, debates, confusion and to experiment with tradition. 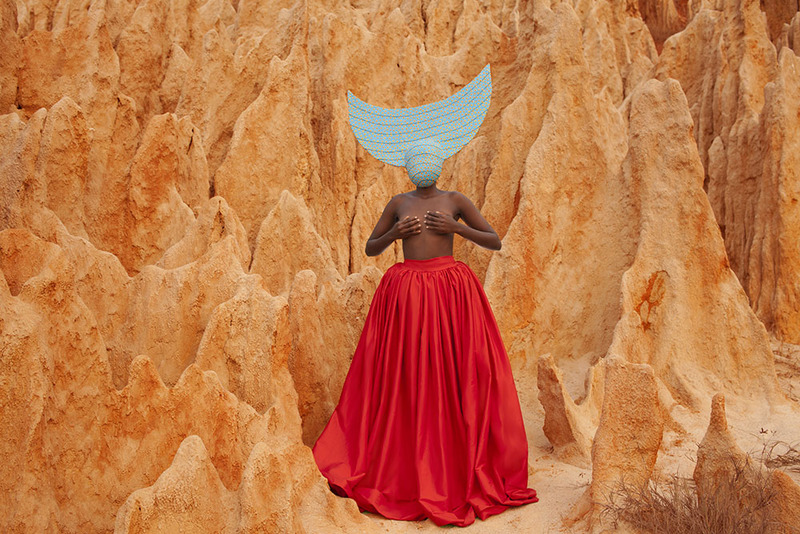 She is a graduate of the Royal Academy of Arts, The Hague, Netherlands, and her work has been shown at Lagos Photo 2016 and at the next 2017 edition, at the FNB Johannesburg Art Fair 2017 and soon, at the Cape Town Art Fair 2018. We interviewed her to talk about her newest work: FORTIA. GRIOT: Describe FORTIA briefly, as you would in a tweet. Keyezua: a very contemporary masked ritual that includes the participation of a group of men with a physical disability. Fortia is inspired by sorrow, loss and survival. How does this translate in the aesthetics of Fortia? Many would consider it aesthetically pleasing. As Fortia means force, I wanted to… the force that I found in this group of men is what I wanted to portray in each mask that we created. It doesn’t translate immediately to those that interact with the image. 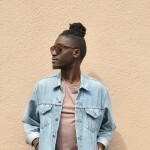 It’s not an easy image to read because it creates the first impression of being what it’s actually not and of connecting to images that we normally associate with certain topics such as beauty, fashion or grandeur. 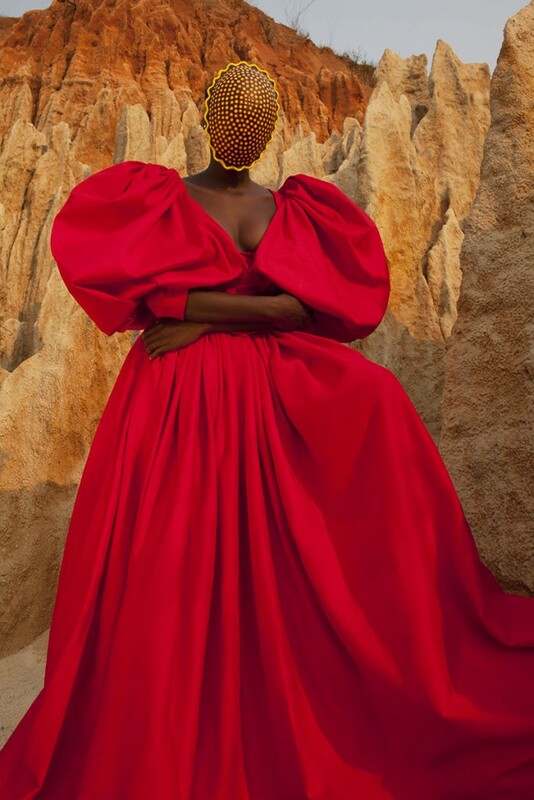 Fortia seduces viewers to think what they normally think, then it attacks the images that they normally connect to physical disability and also confronts them in questioning of why Fortia is only considered a beautiful image in the first reading or just an image of a woman wearing an African mask. It’s later on when the viewer reads the text that the interaction becomes an examination of each detail of the picture. All masks are handmade and designed by the artists. I designed them with a group of six men. In each line, a certain emotion, movement and image represent a part of me as the daughter of this man with a physical disability. The content is important because Fortia tries to bring a different reading to images by creating images that don’t immediately scream sorrow, loss and survival. I think that Fortia doesn’t immediately translate what it should and that is what I wanted to create. Even from history, each mask has a personal story attached to it. When I first arrived in Angola, an old man taught me that one should not just buy masks without knowing the history, without knowing the tribe, without knowing the ritual where it was used, without knowing who made it and why it was made. We often see images of African masks being hanged at homes or being used by African artists and there is a lack of story in it. If you question what was the task of this mask, why it exists, most people don’t know! People just buy it and hang it at home as part of an interior decor thing, which it’s not. A mask doesn’t exist just to exist, it exists to portray the identity of the maker; to tell a story and to reconnect with our ancestors. In Fortia, it is important to understand who made these masks, why they were made and which ritual was done with these masks. Fortia became a ritual that helped me connect somehow with the feelings of sorrow and darkness that I had. I tried to portray these in a very poetic story that actually is what makes the masks have all this worth that they have today for me. I created each image, one by one, and it started from a very personal story. Which brings us back to what I said earlier: a mask is not just a mask just to create something pleasing and a beautiful image of Africa as a whole that can be hanged on a wall or used to make an art piece. It requires some time to understand the ritual. It is important to question, each time you see a mask, why it exists; why it is being portrayed in the way it is being portrayed? Which identity is behind the mask? This is important, very important. We even see often people portraying African masks just as African masks. No. Each mask comes from a certain country, a certain culture, a certain tribe, a certain person, a certain place, a certain hand; it has certain details because it needs to tell a certain story. In Fortia, behind these masks, there is content that makes people understand why the image is exhibited the way it is exhibited: in a very seducing way, in a very surprising way, it tells a story in a way that we would never immediately connect to the image. Is there any allusion to – or sublime critique of – Shakespearean standards of Beauty as represented by the character Portia in the Merchant of Venice in Fortia? So this of course is something that the Portia character has in Shakespeare because she is a very beautiful and seducing woman, but I think that maybe that’s the only thing that can be connected to the play by Shakespeare. It’s intentional to first create a beautiful image but also to create a beautiful image with content. The content should catch most viewers by surprise and make the viewer restart the conversation that they planned to have with the image. In Fortia there is a beautiful strong black woman as a character that seduces the viewer but she somehow tells the story through the masks because each was sketched by me and carefully designed to talk about certain emotions and things that happened in my life. Because I grew up without my father, I lost him at a very young age and it’s my life experience. The readings are in each detail, so I carefully thought; why should this have lines, and why does this have these colours. I grew up in the Netherlands, so a very strong color use that I try to maintain that connects me back to these moments was also the use of white and blue and the use of the traditional milk girl from the Netherlands (the shape) in certain masks, and also the use of dots. It was very essential to create these details because it was somehow a ritual, I call it a contemporary ritual. How was the process of creating Fortia like, perhaps in contrast to the reactions so far? It was very difficult because it was my first ritual… a very personal ritual that comes with the participation of my father’s memoirs. I wanted to create something that would portray such a strong man. It was scary to talk about me, because I don’t normally talk about me as a woman, I talk about others; I talk about other women, I talk about things happening to others and not to myself. This time, it started with me and my loss. It was a journey full of scratches and emotions that I had to control to be able to create a ritual that would help me develop images that could exhibit my feelings in a very honest way. It was a process which did not include any interventions from galleries, curators or opinions of the world. I disconnected from the first thought of creating an artwork. Fortia was not an artwork, it was a ritual first of all. I recreated my emotions in it. This was needed to understand others and to understand physical disability, to explore even the materials that exist in our country, in Angola; a country that is going through a crisis at the moment. These materials can actually create beautiful strong things that can empower this group of physically disabled men or women. Fortia was a ritual, but it was also me exploring the materials that we have in my country and how art can also be connected to therapy for those that are going through difficulty. I was also exploring how it can be connected to innovation, how it can be connected to images that celebrate the survivors of sickness or of war that are physically disabled. I didn’t do much research. I took my life experience and tried several times to portray it in masks, to make it a symbol to that which connects each mask to a ritual; where I as a daughter guide the spirits, memories and emotions to rest, to finally rest. First it was in honor of my father, but it is now… ( I wanted to say hopefully but let’s just pick the good immediately for the future…) I want Fortia to grow into an image that honors each person that battles with an emotional reaction to physical disability and to empower them, to make them rethink things that they can create to economically emotionally and physically empower them, and give them the power to reconstruct their lives without depending on charity. 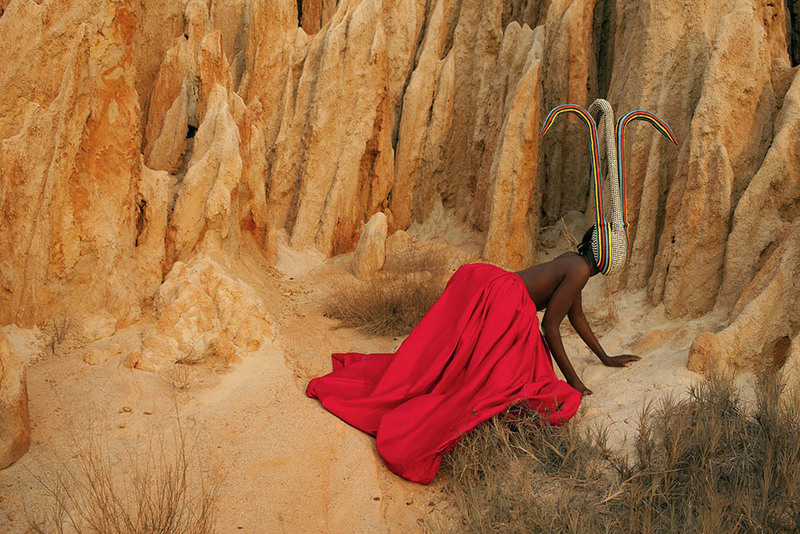 I didn’t know what to expect the first time when Fortia was first exhibited at the Johannesburg Art fair this year (2017). There was a text to guide the viewer. My fear was maybe that people might not take the time to understand this ritual, and that they might misunderstand the images and connect them immediately to an artistic fashionable artwork which was not part of the essence that I wanted to depict in this work at all; it’s just not part of it, so that was my fear. 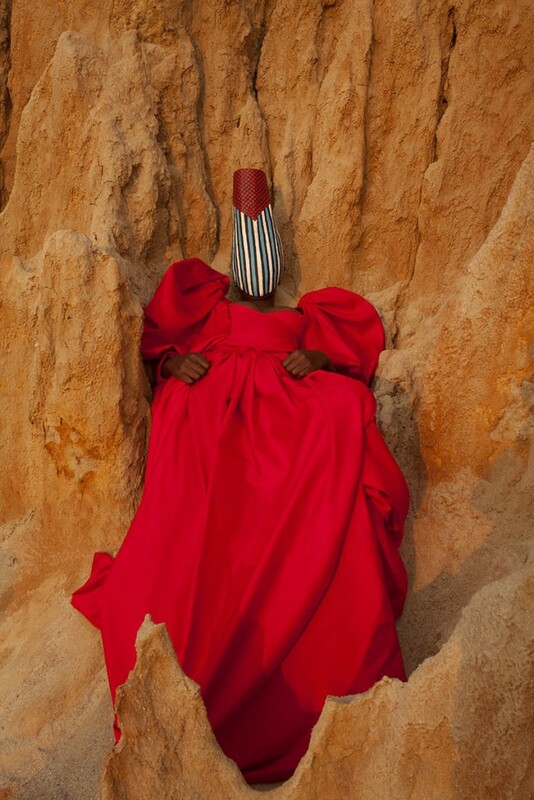 But again I invite all viewers to take their time and to really read the body language, the use of this huge royal dress in it, the use of the masks, the use of the nature around and to just interact with the emotions that I portray in this work. What is next for Fortia and for you as an artist? I continue to explore these images because I think it is something that is no longer about me or my father, it is really about survivors. 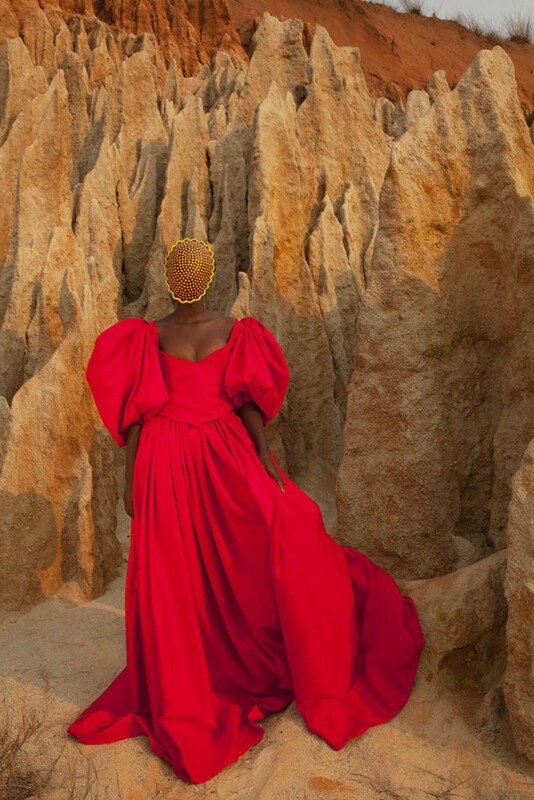 And as an artist I have explored different topics as a female artist, which was needed for me to celebrate my identity first of all as an Angolan-Dutch artist. 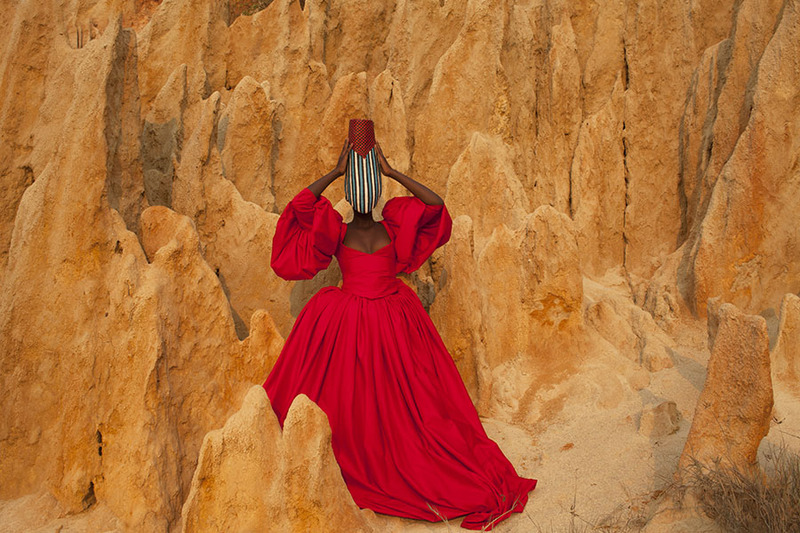 It helped me create the woman that I am today, especially because it started first as; I am an “African” artist. Now, the more I grow, my approach changes. I am now exploring things that can connect me to anyone. Of course it connects me first to the country in which I am currently working, which is Angola; to Angolans and Africans. But right now for me as an artist, I want to be able to connect with anyone around the World. These are things that I think it is up to me to continue to create in my artwork by exploring more than just typical African topics. We as Angolans, as Africans go through so much that is actually also happening in other continents. I want to have this conversations by exhibiting how we are dealing with it in Angola; how we are exploring these different social economic and political changes happening around the world. I am reinventing myself as an artist, and day to day stories of women around the world, especially things that make me uncomfortable to stay quiet, are still the things that I want to explore. I am not an observer, I don’t exist to be an observer, I don’t want my existence to be an observer. I want to talk; I want to use my voice, I want to use my art to actually make things right… in my own way. When I was a little girl, I thought that i needed to become president to help people and to change things. The more and more I empower myself as a woman, as this person that I am and as an artist, I found out that there is so much that I can already change through my artworks, and I am glad that I found this way of exploring the world. This is because i have no boundaries, i don’t owe anyone anything except myself and the world to being the best version of myself that i can be. Especially as an African artist, I want to contribute to what others are already doing; that is creating a force, a huge force. And yeah, that is me.